Folks need help naming Pluto's moons. Actually, they don't any help at all. Scientists and astronomers and such have had no problem naming planets, moons, or other celestial objects before, and they really don't have any trouble now. They want to pacify people who got all ticked off over the demotion of Pluto from planet to dwarf planet. Or, maybe, they just want to get attention or something. Well, they got mine. 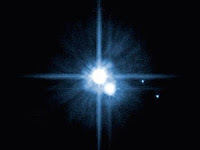 There's a Website that is set up for the purpose of naming two of Pluto's moons. Now, in case you didn't know, Pluto has five moons. Maybe it has more, but they only know about five. They discovered Charon in 1978. I remember that. At the time, they had no real idea just how big Pluto was. They figured it was probably about the size of Earth, though I was never really quite sure why. But, the discovery of Charon, and all the math that led to, came up with the idea that Pluto was a lot smaller than people thought. Then, they discovered more moons in 2005. They named them Nix and Hydra. Then, they discovered two more, in 2011 and 2012, respectively. They haven't named them yet. And, according to the Laws of Science, Pluto can't bring the moons home from the hospital until they have a name. Or something. So, the Website Pluto Rocks (get it?) has been set up to name the two moons. Currently, the frontrunners are Styx and Cerberus. Why a late '70s rock band would get a moon named after them is something I don't understand. Maybe Come Sail Away is a lot better song than I realized. As for Cerebus, that's a dog. Which is kinda weird, since Pluto is Mickey Mouse's dog. Can a dog have a dog? I suppose if it's a three-headed dog, no one would complain. For long. Anyway, most of the names on the ballot are names you'd expect, like Persephone, Hercules, Orpheus, and Barack. Wait. Barack isn't on the list. But they do have a write-in ballot available. Maybe I'll write in a name. It damn sure won't be Barack. But, what should I write in? Or, what would you write in? What should be the names of Pluto's moons?